This is an genuine original replacement Samsung Galaxy Tab 3 7.0 screen in black. The screen assembly includes the LCD, touchscreen and home button, this spare part allows for simple replacement of your Galaxy Tab 3 7.0 screen. If you have cracked the touch screen and or damaged the LCD display then this is the part you need. 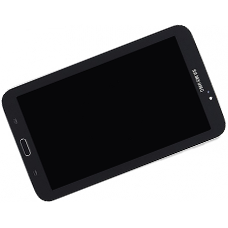 This part is compatible with the WiFi variant of the Samsung Galaxy Tab 3 7.0 SM-T210. * Genuine Samsung Screen Assembly. * Part number: LTL070NL01 , LTN070NL01-001.